Let’s set your dog up for success! Do you know the #1 reason behind most dog behavior problems? It’s a lack of exercise and enrichment for your dog. Doggy boredom leads to digging in the yard, chewing all the wrong stuff and explosive energy that comes out as jumping up on you, on furniture and all out zoomies. I get it! Most of us are having difficulties finding time for fun, play and exercise for ourselves. We also know we pay the price when we don’t make time for these essentials in our own lives. It’s no different for your dog. Exercise, play and enrichment every day are key to good physical, emotional and behavioral health. The good news: In 2015 we have many more options for getting our dogs the play and fun they need. Some will require extra effort on your part and some are simply providing the opportunities for your dog. When you meet your dog’s needs for exercise and enrichment, your dog is certain to reward you. Your reward comes as great behavior from your dog. Whether it’s a couch potato TV watching sort of night or fun out in your community with your dog joining you. Set your dog up for success with energy burning fun and you will enjoy a better life together. Here are some of our favorite dog toys, games, local dog daycares & dog parks as seen in the video. As I shared in the video Dog Daycare quickly became my top favorite. There’s nothing like playing with other dogs to tire out your dog. Not all dogs are keen players, so be sure you’re aware if this is considered fun for your dog. In my experience most young dogs love to play with doggy friends. My favorite Dog Daycare in Minneapolis, MN is hands down Metro Dogs Daycare and Boarding. Located in the North Loop of downtown Minneapolis with 6 separate play areas, each set up to fit your dogs size, age and playstyle. Amy Rosenthal and her team are focused on providing your dog loads of fun in a safe environment. They have a puppy program that slowly prepares your puppy for a life of enjoyable play with friends. My Favorite Dog Daycare in St. Paul, MN has always been Dog Days Inc. With 3 convenient locations all located in St. Paul. Wendy Harter was one of the first dog daycare owners I got to know when first exploring the business. She and her team at Dog Days are a wealth of knowledge and committed to providing you and your dog a magnificent experience each and every visit. Dog Days playrooms are HUGE, loaded with toys and a hands on staff that engages and plays with the dogs in care all day, every day. I’ve written an article to help you choose the best dog daycare in your area. Both Dog Days Inc. & Metro Dogs Daycare and Boarding meet and exceed every one of my recommendations. Explore various doggy daycares in your area and choose the one that will provide fun and great care for your puppy or dog. There’s been an explosion of Dog Parks in nearly every community over the past decade. I believe this is Awesome! Off Leash Dog Parks offer dogs opportunity for fun and play with friends that play more like they do, dog friends. With every new thing that arises, there always comes a learning curve for those that participate. Dog Park participants are going through this learning curve right now and we at Team DogSense want to help. I’ve written several articles to help all of us up our game as participants at our local dog parks. As Maya Angelo always said, when we know better, we do better. Before you head out to your local dog park for some doggy fun, check out my dog park tips articles and be in the know of how to provide responsible and safe fun for your pup and friends. Now for my favorite local Twin Cities Dog Parks! This dog park spans for acres featuring trails, woods and hiking along the Mississippi riverfront. Beautiful scenic hikes with your dog leading to large open spaces for play and river swimming fun with doggy friends. Parks that offer a good hike before reaching the large open play spaces help set your dog up for much greater doggy play success. Hiking first allows your dog to burn off some of those ya-ya’s before engaging in fun romping and wrestling with other dogs. This creates the ultimate experience for everyone. Battle Creek Off-Leash Dog Park is a huge 35 acres of doggy romping fun. Wooded trails, 3 ponds for swimming fun and 2 social play areas provide everyone just what fits your dogs needs. Whether your dog enjoys hiking, swimming or playing with doggy friends Battle Creek offers the space that’ll work for your specific needs. Another BIG plus is Battle Creek Dog Park is totally free! Parking and play comes at no cost. However, if you can afford to contribute, please do. Donations go to improving the park each and every year. The Twin Cities Airport Dog Park is the unofficial dog park. Residing on airport property it is not fully fenced but consists of a whopping 80 acres of dog fun. Hiking and massive open play spaces offer great opportunities for wide open running fun. The regulars that attend this park are knowledgeable and helpful. If you have questions or concerns, strike up conversation with anyone in the park. Everyone there is interested in providing safe fun for all our dogs and are always willing to provide newcomers the guidance they need. Alimagnet Dog Park has got it all. 8 acres, all fenced in with hiking trails circling a big pond. A separate play area specifically designed for young puppies, small dogs, shy or fearful dogs and our older pups that need a space away from the rowdies. Double gated entries provide great safety as you enter. A dog washing station located just outside the park allows you to rinse your dog before you leave. I’ve been going to this dog park for years and the people are some of the kindest offering a wonderful friendly dog community. Every dog park is a community of dog lovers that care about providing our dogs a safe and fun off leash dog play experience. Please be kind and learn about the rules of each park you attend. We’re all still learning about this wonderful new phenomenon of dog parks and it’s important we keep improving each and every year. Be a mindful participant and enjoy the fun for all. A fleeing swirling ball flying through the air. Most dogs find this brilliant fun. A chuck-it ball launcher makes it possible for anyone to throw that ball fast and far. Providing your dog a fast and fun run again and again. I rarely come across a dog that doesn’t love a game of tug. The great thing about playing tug is you don’t need a lot of space. It’s a game you can easily play indoors and it burns loads of energy. I recently came across the greatest dog tug toy called Hear Doggy. They’re stuffed toys with a squeaker…but here’s the part you’ll love, only the dog can hear the squeaking! If you’ve ever had a pup with a love for the squeaky stuff, you’ll know exactly what I mean when I say, Halleluja! These toys are durable and cute, cute, cute too. Dogs that take to the frisbee are a total blast. I have a dog training client now I’ve been teaching to run out after a swirling frisbee. It’s so much fun to see this athletic pup get air! I’m quite selective in my frisbee as I’m a typical dog mom, worried about my pup getting hurt. West Paw and Booda both make frisbee’s that meet this dog mom’s worried needs, soft on the mouth. We all know running is one of the top cardio activities we can do. This applies to your dog too. I’ll remind you again though, if you’re going to put in some distance please check with your vet and make sure your dog’s athletic body gets what it needs. A waist leash is great for running and provides more safety keeping both your hands free. My personal favorite is made by Mighty Paw. My sweet dog Buddha’s favorite game of all! Most dogs love to chase and a stuffed squirrel will bring out that predatory fun fast. We’ve had our Squishy Face Flirt Pole for nearly a decade, so it’s given us years of chasing fun. Whether it’s a rainy day or blustery cold, you can still enrich your dog’s mind through find it games. Mental stimulation can be just as draining of energy as physical exercise. Think about yourself and how your energy can be entirely zapped after intense focus on figuring out a particular task. Lots of brilliant company’s are now investing in developing more and more toys for mental enrichment for our canine friends. Dog puzzle toys are great for building learning of fine motor tasks. It’s a blast to watch as your dog works through the puzzle of how to get those snacks. Some will use their paws and some will use their snout. It takes lots of trial and error for your dog to develop his personal route to success. Nina Ottoson has become the queen of dog puzzle toys and offers a wonderful assortment. A new company that was funded through Kickstarter, developed the Foobler that can be set up with a timer for varying times of the day where the game is made available to your dog while you’re gone. How cool is that? Dog Training games come packed with it all! You expend some of that energy, achieve mental enrichment through learning, strengthen practical behaviors and build more of a bond and focus between you and your pooch. Dog Training games are key for building communication between you and your dog that you’ll be able to use in every day life. It’s a ton of fun and who does your dog love playing with more than you! Learn how to train practical every day behaviors step by step through our online dog training videos. 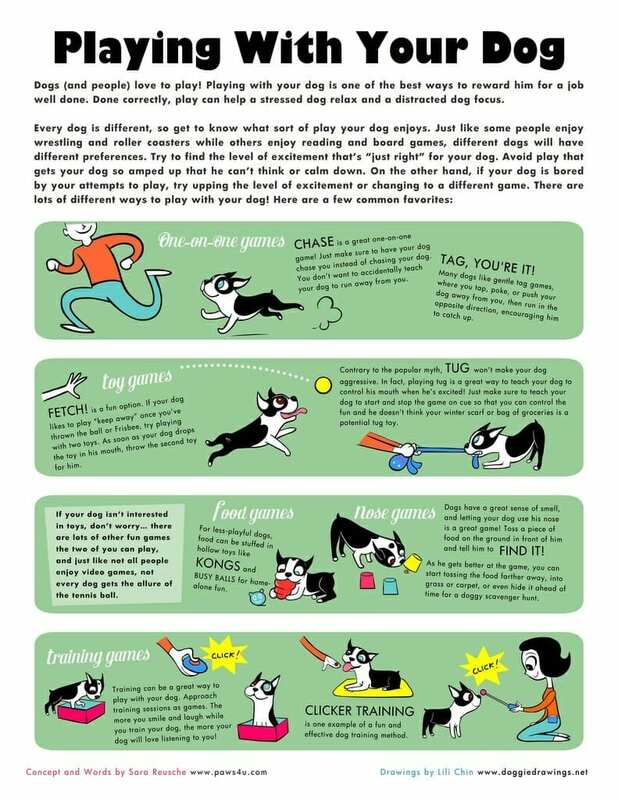 Here is a fantastic visual by Sara Ruesche from Paws 4 U, a local Minnesotan and Lili Chin from Doggie Drawings. Get your play on, have fun & enjoy your dog! Don’t miss our DogSense Puppy Training Classes in Minnetonka for puppies under 18 weeks old or DogSense Off Leash Dog Training Classes in Minnetonka for dogs over 18 weeks old. Our puppy classes and dog training classes are not only the best in town, their filled with loads of fun and learning for both pups and family! Previous Post Best Dog Walking Tool | Go Anywhere Dog™ | Minneapolis, MN Next Post Is Your Dog Happy?